Quakers is a commonly used name for the Religious Society of Friends. Whether the term was originally meant to be derogatory or not, it is now embraced. The Society of Friends was formed in 17th century England. Quakerism spread particularly in northern England during that century due to missionary efforts. 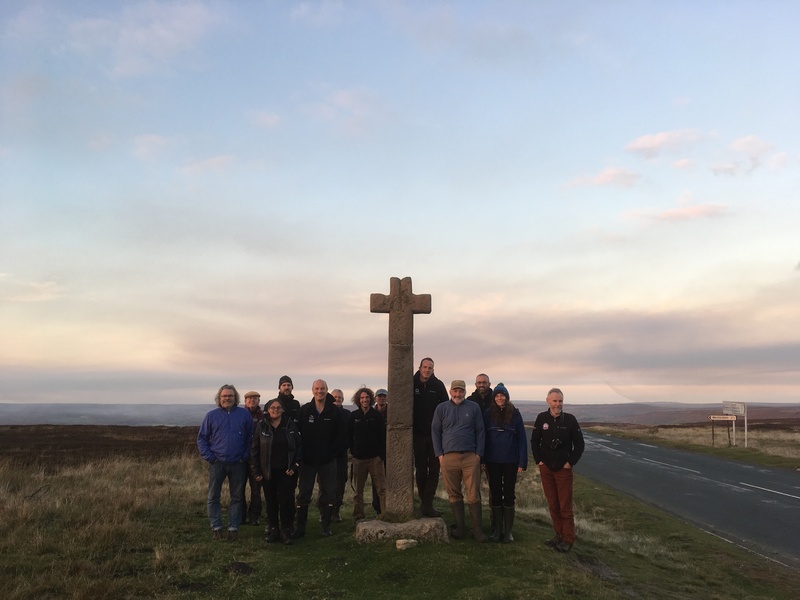 In the same way that Methodism took hold in the North York Moors in later centuries, the Society of Friends found ready converts in this area due in part to the distance from centres of authority and conformist religion. The founder, George Fox, had an understanding of Christianity that differed from that of the established Church of England at the time – he believed that there was something “of God in every person” (i.e. an inward light), people didn’t need Churches or Clergy to experience God they could do it themselves and have their own direct relationship. This idea of equality of all and divergence from the norm didn’t go down well in a period of Civil War, Interregnum and Restoration. Fox and others who thought the same way and who met together to listen to God, were imprisoned over and over again. Official persecution ended in 1689. After the initial period of conversion the Society turned inward and consolidated. New generations of Quakers sustained the Society – they didn’t need special buildings or clergy, their local meetings acted as self-regulating communities. A way of life was expected based on morality, honesty, diligence and most importantly, an inner conviction. The life of Joseph Foord, the land agent responsible for the engineered water races of the North York Moors, provides an example of how sometimes it wasn’t always easy for members of Quaker families to live up to all the expectations – Joseph was officially disowned for fornication. When he was buried, years later and away from home, he did end up in a Quaker cemetery although recorded as a ‘non member’. Maybe not having inherited a place in the establishment, and having therefore avoided a classical only education and a disdain for business, individual Quakers worked hard for a living and for the betterment of all. They had big impacts in the industrial revolution of the 18th and 19th centuries including railways, and the iron and steel industries on Teesside. Quaking grass is a common wild grass found in unimproved or semi improved grassland habitats on dry soils and slopes, the less nutrient rich the better. It relies on traditional hay meadow management (grazing or cutting) to give it a chance amongst more competitive grasses. It has thin delicate stems ending in small coloured ‘locket shaped’ flowers which are what quake and tremble, making the grass easily identifiable in the summer when it stands out amidst the surrounding sward. The quivering movement and the rattling sound engendered make this grass particularly appealing and over time it’s been given a variety of different names based largely on the movement – Dothery dock, Shivery shakes, Wiggle waggle, Tottergrass, Quakers-and-shakers etc. These are 28 Special Qualities of the National Park identified in the Authority’s Management Plan of 2012. 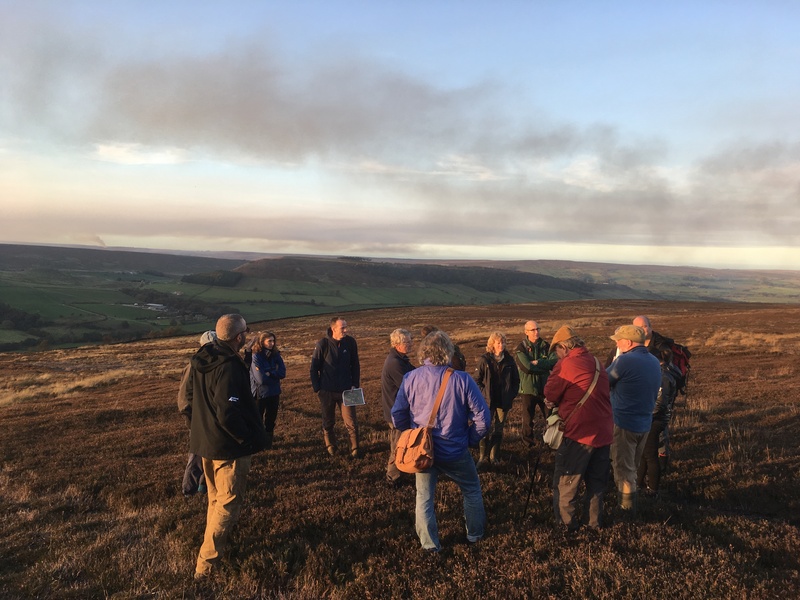 The idea was to put into words the elements – landscape, environment, heritage and the feelings engendered – that make the North York Moors what it is i.e. special. It’s not an exhaustive list, everyone will have their own opinions, but it helps to illustrate the fundamental aspect that the whole has many valuable and interrelated parts. 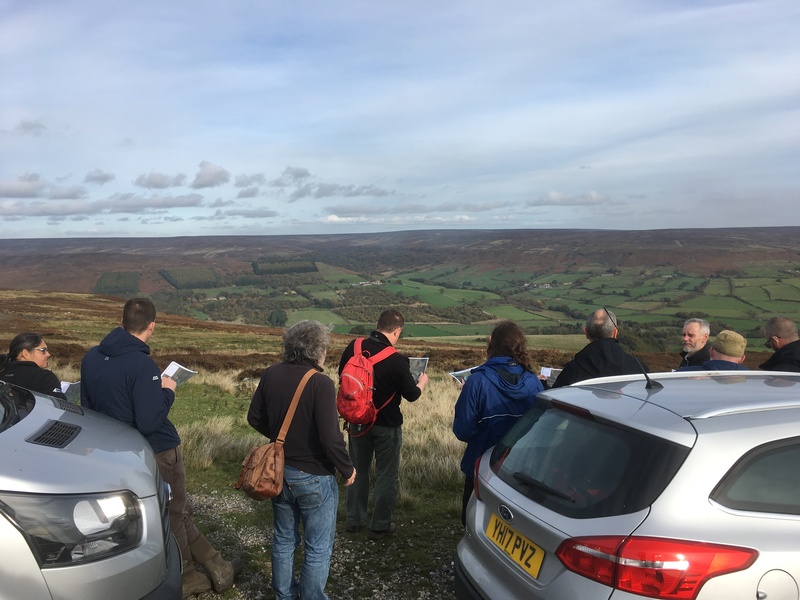 Mineral resources from the North York Moors – limestone, sandstone, alum shales, ironstone, whinstone – have been quarried since the prehistoric period. Quarrying is a lot easier and cheaper than actual mining but depends on the mineral sought being close to the surface so it can be dug straight out, cutting into and manifestly changing the landscape. The available resources have been exploited to provide for local populations and sometimes the national interest if quarried on an industrial scale. 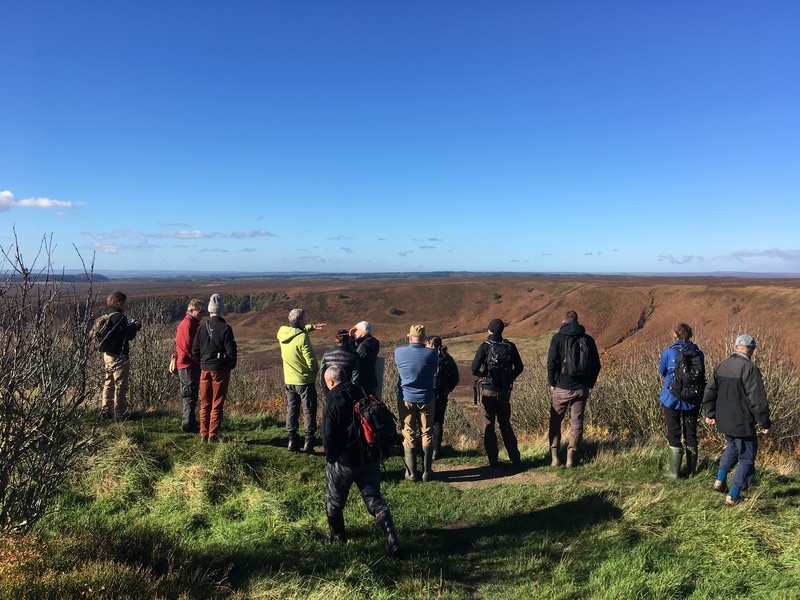 Now the majority of these local quarry sites have been abandoned, but it is still possible to identify these artificial landscape features all over the North York Moors. As well as having historic interest – sometimes you can see tool markings on a face, these sites have been re-colonised to some degree. 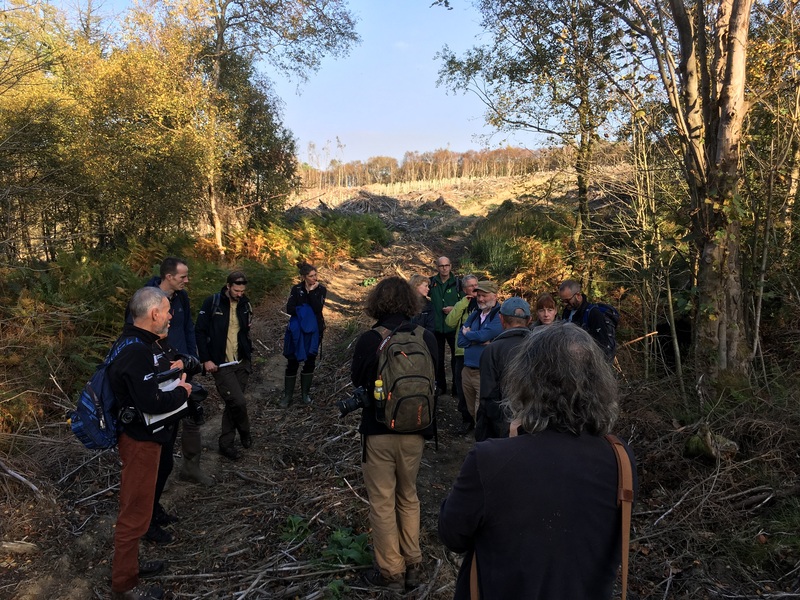 Quarry sites provide refuges of uncultivated undisturbed land where since quarrying stopped unexpected plants and animals have moved in making the most of a habitat of rocky outcrops and thin low nutrient soil. These often isolated man-made sites can be extremely valuable for biodiversity such as cliff nesting birds like Peregrines and Kestrels and alpine plants like saxifrages. 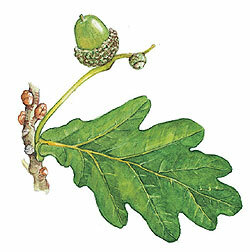 Quercus is the genus (Group) name for Oaks. 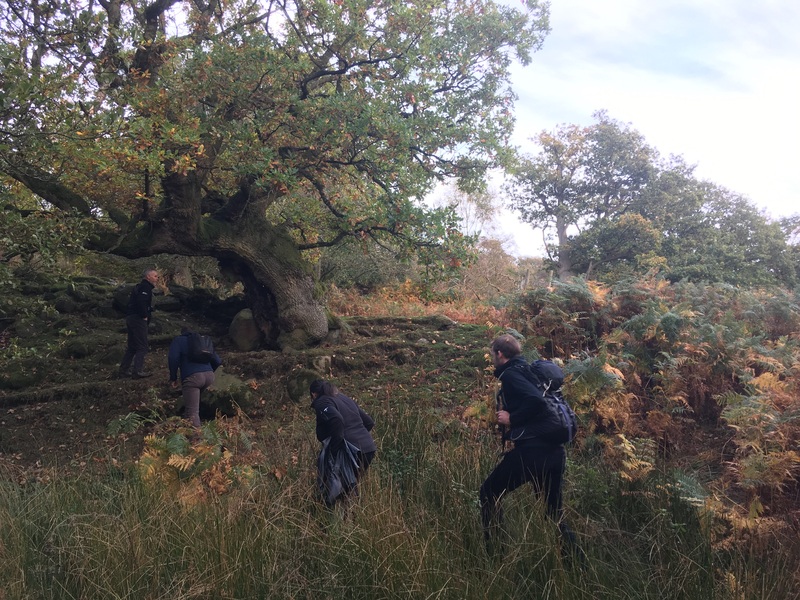 There are two species of Oak found in the North York Moors – Pedunculate oak (Quercus robur) and Sessile oak (Quercus petraea) – as well as hybrids of the two. 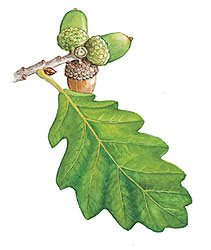 The difference between the two main species is that the acorns of Pedunculate oaks hang from stalks (peduncle) whilst Sessile oaks produce acorns directly from their twigs – so you have to look carefully to tell the difference. 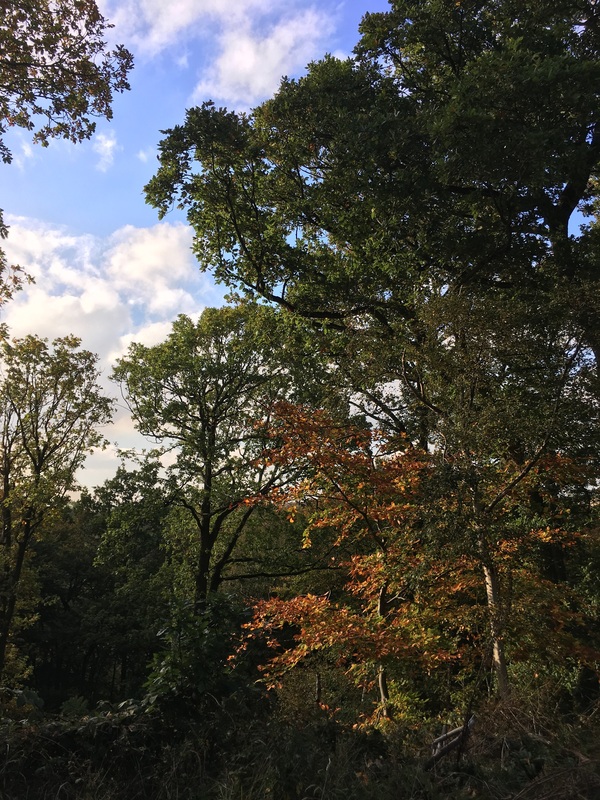 Pedunculate oak is also known as the English oak and the Common oak in this country because it has been so widespread in woodlands, hedgerows, fields and parkland. 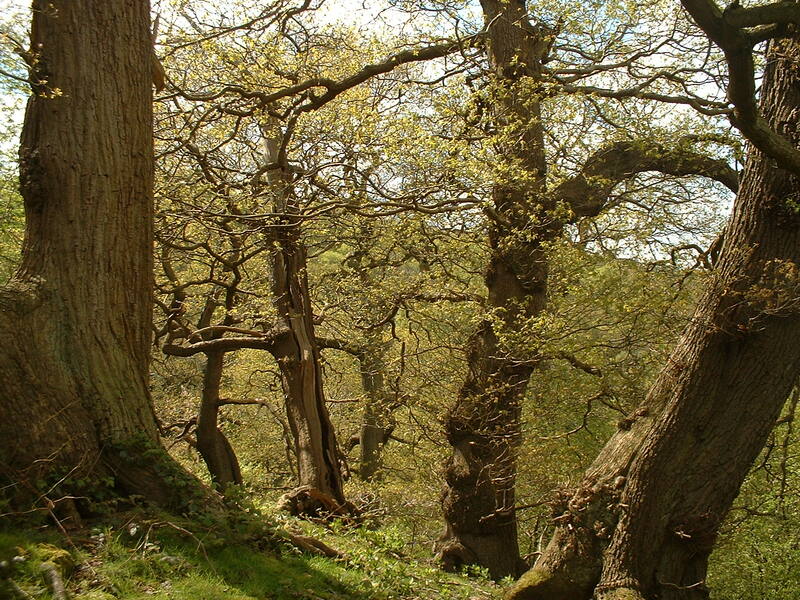 Sessile oaks tend to be found in upland areas in the UK, in places like wooded gills because they prefer dry soils. Some of the most magnificent looking oaks in the North York Moors are Veteran Trees because oaks can last for hundreds of years if allowed to flourish in the right conditions. 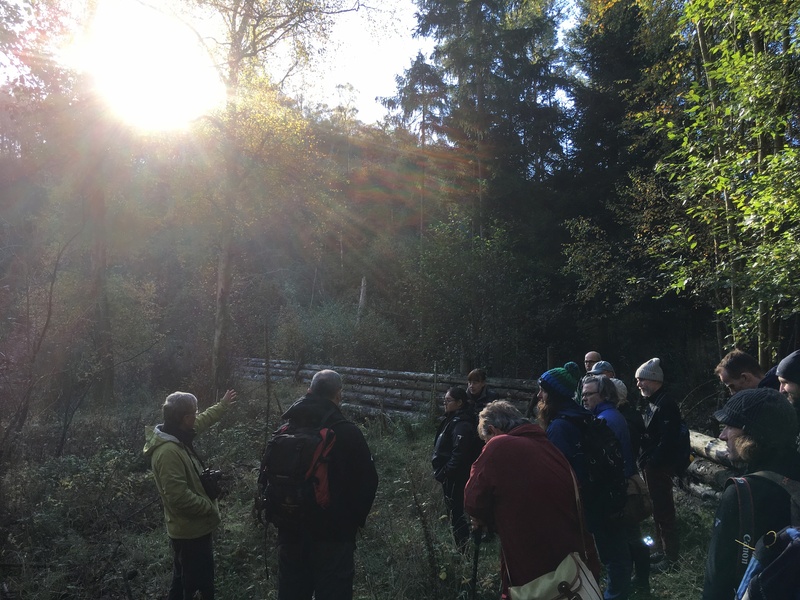 Oak woodlands are great biodiversity habitats for mammals, birds, invertebrates, fungi and lichen amidst the living and dead trees. Sunlight can penetrate the oak canopies to reach the ground and enable ground flora to flourish. 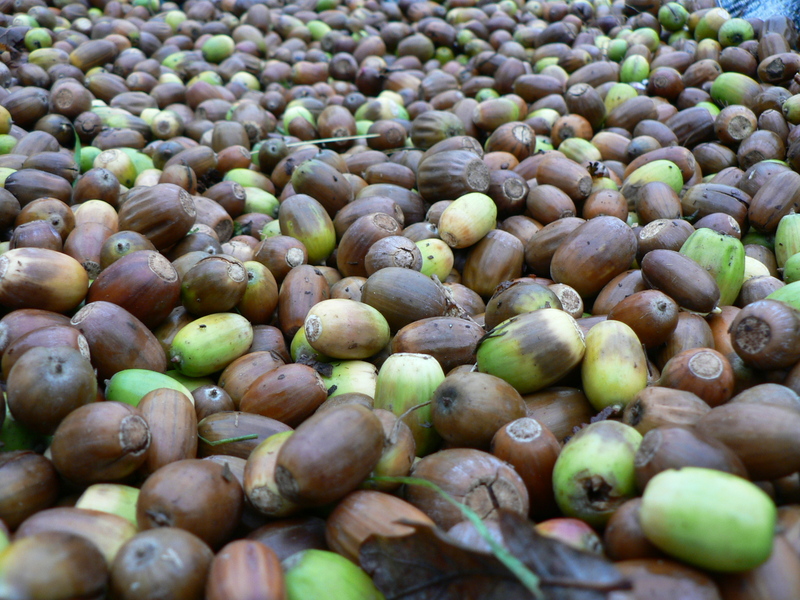 Acorns are reasonably easy to propagate, by collecting local acorns to plant out in new woodlands the local provenance can be sustained hopefully for hundreds of more years. 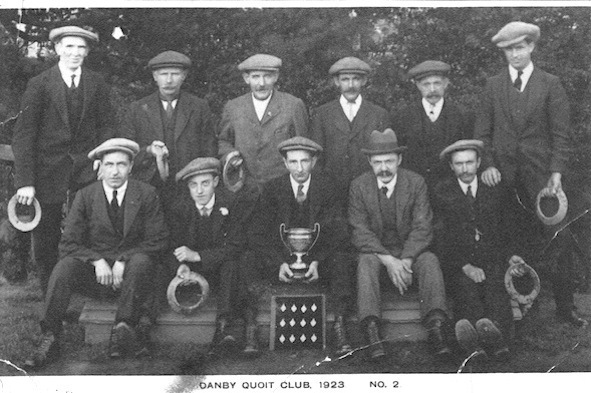 Quoits continues to be played competitively in the North York Moors through the Danby Invitation Quoits League and the North Yorkshire Moors League, in Esk Dale. The heavy metal quoits (originally two horseshoes forged together?) are thrown with the ultimate aim of encircling iron pins (‘hobs’), 11 yards away, set in a square of clay. Like all the best traditions there are lots of specific terms and rules used when it comes to playing e.g. a ‘Frenchman’ is the term for when the quoit lands underside (the ‘hole’ side) to the right of a hob. Different versions of Quoits are played in different UK regions and countries. The variety played in the North York Moors is part of the northern England tradition which is also played in Swaledale, County Durham, Cleveland and Northumberland. It seems this north eastern sporting tradition, formalised in the 19th century, came out of a shared mining background and survived the end of that industry in the local area. Quoit pitches are often located close to Public Houses or Village Halls, all focuses for social interaction. 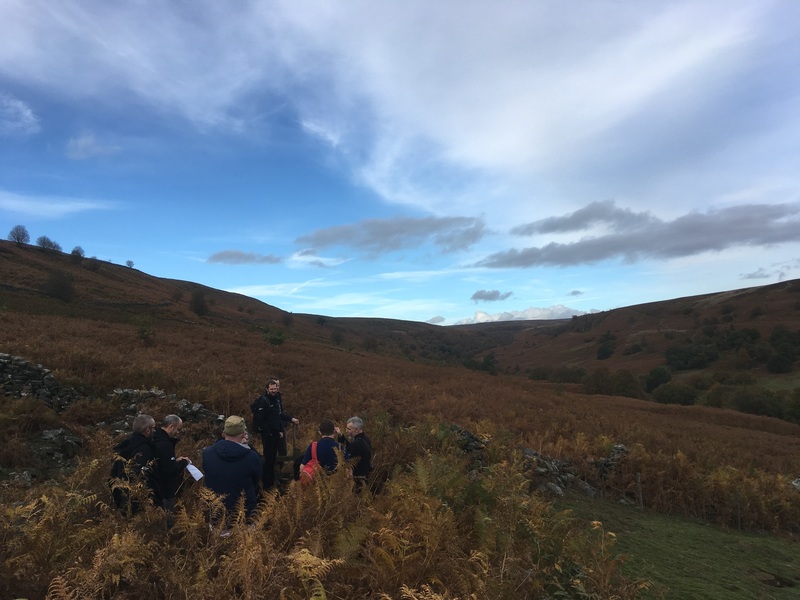 There are pitches (and matches) in a number of villages in Esk Dale; a few years ago funding through the North York Moors, Coast and Hills LEADER programme (in a previous incarnation) helped restore the pitch in Fryup Dale. The British Film Institute’s Britain on Film Archive holds a number of amateur and professional films that feature the North York Moors and provide a treasure trove of 20th century cultural heritage. Each film is of its time – the sensibilities, the landscapes, the cars (or lack of them), the clothes – from a 1927 mediaeval pageant performed at Mount Grace and starring Sir Hugh and Lady Bell; to the Yorkshire Television documentary from 1985, The Unsleeping Eye, which went inside the RAF Fylingdales early warning station and couldn’t be more Cold War centric. But many of the elements are also familiar – children playing on the beach, boys not wanting to dance, moorland sheep wandering across the road, the appeal of steam locomotives, and the unending desire to record moments in time. The Yorkshire Moors 1950 features a mother and daughter, and two small dogs, exploring the moors and dales and ending up in Whitby where inevitably they count the 199 steps up to the church. There is presumably a husband/father behind the scenes taking charge as Director and Camera Operator. The North York Moors National Park was designated two years later and the landscape as seen was one of the main reasons for the designation. But its not all pretty scenery; for a few seconds there is a view of ‘disused iron ore mines’, which are probably near Skelton to the north of the present day National Park. Staithes 1959 heavily features the village of Staithes and its cobble fishing as well as recording the wider countryside round about including the eroding alum industry remains along the cliff edges and shore line which have eroded a whole lot more since. Without any sound or any intertitle cards the film maker’s motivation is left to the viewer’s imagination. And then there is The Children of Eskdale made by Yorkshire Television in 1973. It’s a fly on the wall documentary about two generations of a farming family – the Raw family of Fryup Dale. It’s about ordinary life in the early 1970s that happens to be on a farm in the North York Moors with all that entails. It comes with the low key reflection by John Raw on the dispatching of a couple of bantams “they come but they’ve got to go – that’s farming for you”. The coldness of the winter landscape contrasts with the warmth and care that the family members have for each other. It ends with a understated act of familial kindness.